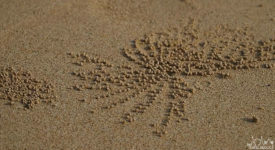 We saw these little Sand Bubbler crabs making their homes in the sand of Ao Nang, Thailand (which is in Krabi). Turns out they make these little pellets in search of food. There were thousands of these crabs and it really made the beach that much more beautiful.